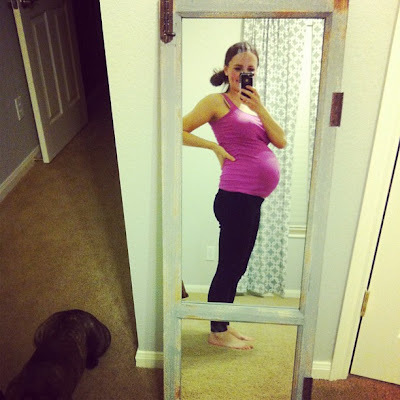 Thoughts: I am officially in my 3rd trimester of pregnancy! What seems like the impossible also seems like it's been a long time coming.Things are getting more real, or "surreal" really. We spent lots of the weekend watching my belly move and talking about what our son will be like. Kicks used to just be a fun little jolt but now I think about my baby boy in there, picturing his face, his little lips and head of hair. Baby: he is 16 inches long and more than 2lbs! Yesterday the app said cucumber and today it says head of cauliflower... weird. We go in next week for an ultrasound so hopefully they can give us an estimated weight. He can dream now which is cool and his hearing is fully developed. Symptoms: Zofran free for 11 days! Haven't really felt nausea in the past week but the bloody nose has come back. I've also had a really drippy nose (no other allergy symptoms) which is a pregnancy thing. I've noticed how easily I get winded the past week. Wow! I feel like a Biggest Loser contestant on week 1 and I am sure it will only get harder haha. La linea negra has started to show thanks to me being so pale. It is not too dark but it's funny because my belly button is off centered and the line is right down the center of my tummy so they don't exactly line up. Movement: all the time! Like the books say, I can now recognize his sleep patterns and know when he is awake (because he kicks me non stop). I got one kick on camera but he is shy when I try to record! We also shined the iPhone flashlight by his head (books say he is sensitive to light) and he kicked me hard. Stubborn boy. Cravings/aversions/eating: pretty much eating anything and everything... lots of fruit and chocolate, and drinking TONS of water. Workouts: slowly getting back into them. Light weights and walking are my favorites and I hope I can do some swimming soon. Sleep: good! Sunday night I didn't wake up to go to the bathroom at all... score! I've found myself sleeping on my leftside pretty much the whole night, which is recommended. Doctor appointments: next Monday I go in for my glucose testing and we get to see our little guy via sonogram. My appointment is at 12:15p and I was told I can eat breakfast as long as I fast for 4 hours. I am not trying to cheat the system but any recommendations on what to eat the day of? I normally have cereal but want to do something with less sugar. Find other pregnancy related posts and weekly updates here! You are just so stinkin cute! That must be so freaky, to feel the baby kick! How stinkin' cute are you in your lil bikini! I CANNOT wait to see Baby H's nursery! Isn't feeling the baby move the absolutely most incredible feeling EVER! I really miss it! And hooray for the FINAL trimester! Little man will be here before we know it! <3 And thanks for linking up!!! You look SO SO fabulous ma'am! Yay for being pill free for 11 days now, so happy for ya! And you totally have me curious now why you covered up a tattoo, ha! You are so adorable! I am nervous about rocking a bathing suit this summer... but being due in October, and having a water-loving toddler, I know I'll need to get over my fear. You look great! I ate eggs, turkey bacon and buttered toast before my glucose test. I also usually have cereal but didn't want to set anything off on the test and risk having to take the longer one. You look adorable. My 'line' came much earlier than 27 weeks and was dark the whole time...and I am a pretty pale person. So interesting how each and every pregnancy is different!!! You are so dang cute! I've got the line too and my belly button isn't centered so it looks silly! I didn't have to fast for my glucose test, but I definitely didn't have anything sugary that morning! I was told to stay away from potatoes too! So cute!! Your baby bump is adorable!! I'm so happy you have been feeling well and not needing to take medicine! Baby boy is going to be here so soon!! You are too cute! I had planned to wear my bikinis for swimming while pregnant...think again..I can't squeeze into the tops! :( When I had my glucose test (I passsed!!!) my doctor said to try to eat more protein. I had my appointment first thing in the morning so I didn't eat, but maybe try eggs or something like that. Good luck! I'm sure you will pass! I want to know what's under that little cartoon elephant Ruthie!!!!! Watching my tummy move when I was pregnant was seriously the best thing in the world. I loved it, and you're going to be so happy you have videos of it! You're the cutest pregnant lady ever! I'm also very curious as to why you covered up a tattoo haha. Always look forward to your posts! I am currently just about 12 weeks along with our third little bundle! Saw your "request" for tips on what to eat before the glucose test...I failed both one-hr tests (both pregnancies) and ended up only having Gestational Diabetes with my second pregnancy (which was a huge shock bc I am a healthy eater and super active). Seeing how effective protein was at counteracting sugar, I would say to stick to a protein-packed breakfast that morning. Also, drink a good amount of water throughout the morning. Good luck; I'm sure all will go absolutely GREAT! Thanks for allowing us readers to follow along with your exciting journey to mama-hood!! Love the bikini pic! You're so cute. I love being able to watch my belly move around, too. Just yesterday I could feel the baby's foot at the top of my belly. So I sat there just rubbing it for as long as I could before he finally moved. I have to go in for my glucose testing this weekend. I have the dreaded 4 hr test since I tested high with the 1 hr one. 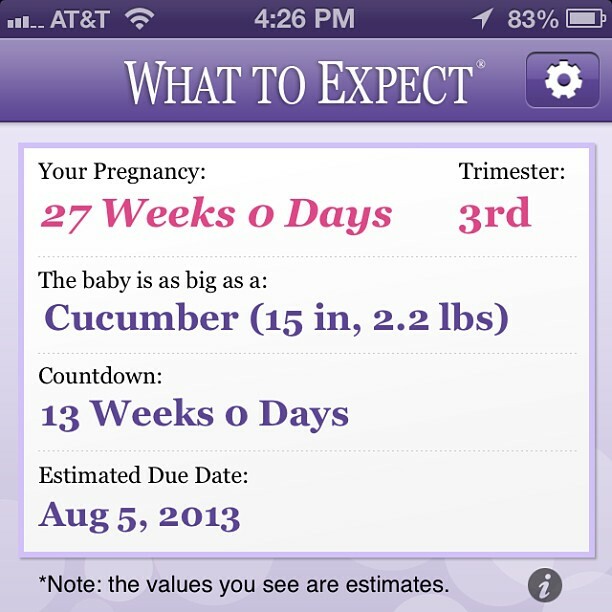 Yaaay 3rd Trimester! That's an exciting feeling. & Giiirl you look wonderful and beautiful with a blow of perfection. Aww that video <3 I really miss the feeling! That was my favorite part of pregnancy! I have a tat too! Their baby feet behind my ear. It's a dedication and in memory of all the sweet victims we lost to abortion. I plan on getting another one soon! My doctor recommended staying away from carbs when I was getting ready to take my glucose test. So I had eggs and veggies. I second what everyone said about eating plain eggs. Good luck! You are so cute! & I love the sneak peek of the nursery and your bikini pic! Can't believe you are in the third trimester, so exciting!! im a new follower. and i am SO glad to have found you!!! congrats on your pregnancy! i cant wait to read along! I thought your suit (with the elephant) was the newest style in maternity wear..HAHAH!! You and your little belly are so stinkin cute, it's not fair! Love the video, too, so fun to see baby boy moving around! Just wanted to say hi and introduce myself as your newest blogger. I'm enjoying your blog- congrats, motherhood is incredible. I just had my sweet baby girl six months ago. Hope you'll stop by my blog. HI Ruthie! You look adorable and I'm glad you've been able to go zofran free! I know doctors say that you can eat before your glucose test... and maybe my experience was different than most, but I carefully watched what I was eating the day I had my first and I failed it by a small margin. Then I had to do the dreaded three hour one and since I fasted, I passed with flying colors. This time around (now pregnant with our 2nd little one) I knew better and fasted completely even though they told me I could eat anything... I passed again with flying colors. I feel like any kind of food consumption before hand might skew the numbers a bit. But do whatever you're comfortable with. I hope it goes well! 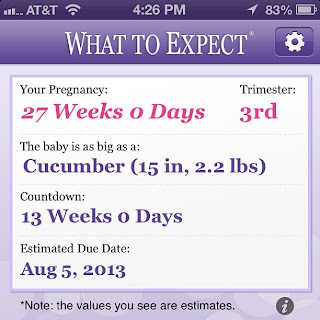 There truly IS an app for everything...love the pregnancy app! If you can, try some eggs the day of your glucose test. The protein will keep you feeling full and the sugar will be low. That was not my favorite test, but it is better than being unable to go to the bathroom prior to an ultrasound. Do they still make you do that? Glad you're still Zofran-free! You are super cute In a bathing suit Ruthie!! I love that hat! Excited to see the nursery in the near future! Eggs are a good thing to eat before the glucose test. I can't even remember what I ate, but unfortunately eggs make me sick while I was pregnant, so those were out. You look really good! Pregnancy flies by so fast! Also, if your doctor has the choice between the drink and jelly beans, choose the jelly beans. So much easier to stomach! Oh my gosh, you look SO cute! I went to Vegas when I was 26 weeks pregnant... you wouldn't believe the stares I got at the pool, ha ha!